All hail zucchini. It’s proven to be one of the most versatile summer foods, although often under-appreciated. When to Buy: Zucchini is easy to grow in many parts of the US, so it’s pretty much available year-round in grocery stores. Keep an eye out for it at farmer’s markets during the summer. You’ll be able to buy it in large quantities for a buck or two. What to Buy: Zucchini can go bad pretty quickly. When purchasing, zucchini should be very firm to the touch. Avoid any pits or holes in the skin. The skin should be shiny, and might be a little prickly. Prep & Storage: Do not wash zucchini until just before you are about to use it. Store it in the fridge, but if you are putting it into a plastic bag, make sure that no condensation develops inside the bag, as this will hasten the spoiling. Check zucchini daily for any softness, and use within 3-4 days of purchase. Even cooked zucchini does not last too long. 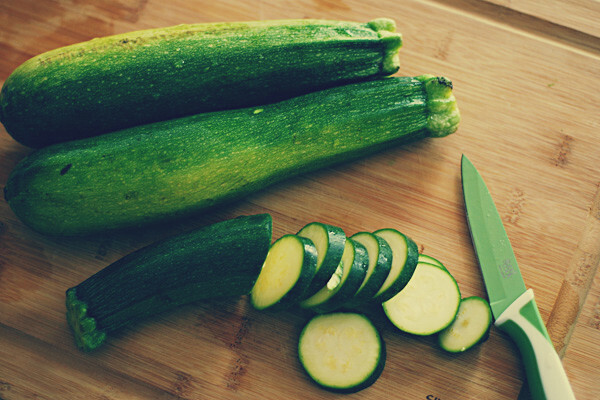 To prep zucchini, wash it thoroughly and cut off the stem. Slice into thin rounds or shred. You do not need to remove the skin. How to Cook: Bake it into bread and you have a sweet, spicy loaf that rivals pumpkin bread. Throw it in cookies or shred it into a salad. Or, bread it and pan-fry it, serving it with tomato sauce. What’s that? Zucchini is a key ingredient in the famed French ratatouille? Look, I’m just trying to make a case here. We all might overlook zucchini at the farmers’ market, as it is a plain green tube-like vegetable, without the sparkle of berries or color of heirloom tomatoes. Zucchini, however, is a kitchen staple. Personally, at dinner time, nothing beats a few slices, sprinkled with some sea salt and red pepper flakes, brushed with olive oil, grilled until slightly charred. Fun Trivia Fact: The zucchini is technically a fruit, since is actually the ovary of the zucchini flower. Zucchini Citrus Cookies are a slightly healthier summer treat. Zucchini Latkes are yummy, and pretty with their hint of green. Zucchini Bread is freakin’ awesome, and it’s fun to feed it to people who have never heard of it before. “Vegetable…sweet…bread?” It takes them a little bit to wrap their heads around it, but one bite and all doubt vanishes. Shredded zucchini becomes the creamy filling of this Golden Zucchini Sandwich, a twist on grilled cheese. Zucchini-Tomato Curry is a light vegetarian supper that keeps your fresh zucchini in deliciously large chunks. Finally, my tried-and-true personal favorite, Turkey & Zucchini Meat Loaf with Peach Dijon Glaze. Meat loaf haters might want to try this one out. I am an avowed loaf lover after making this. It’s lighter than a heavy brick of pure meat, and the glaze offers the perfect countering sweetness. Kenzie Zimmer loves zucchini all day, every day. She cooks and lives in Minneapolis.